When the Women’s March gathered millions just one day after Trump’s inauguration, a new era of progressive action was born. Organizing on the far Right led to Trump’s election, bringing authoritarianism and the specter of neo-fascism, and intensifying corporate capitalism’s growing crises of inequality and injustices. Yet now we see a new universalizing resistance among progressive and left movements for truth, dignity, and a world based on democracy, equality, and sustainability. Derber ​offers the first comprehensive guide to this new era and an original vision and strategy for movement success. He convincingly shows how only a new ​universalizing​ wave, a ​progressive​ and revolutionary "movement of movements," can counter the world-universalizing economic and cultural forces of intensifying corporate and far-right power. 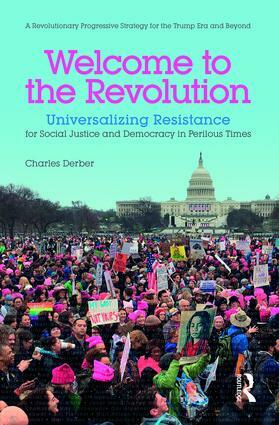 Derber explores the crises and eroding legitimacy of the globalized​ capitalist system ​and the right wing movements​ that helped create the Trump era​​. He shows​ how​ left universalizing movements can--and must—converge ​ to propel a​ mass base that can prevent societal, economic, or ecological collapse, stop a resurgent Right, and build a democratic social alternative. He describes tactics and strategies for ​this​new progressive movement. Brief guest "interludes" by Medea Benjamin, Noam Chomsky, Ralph Nader, Bill Fletcher, Juliet Schor, Gar Alperovitz, Chuck Collins, Matt Nelson, Janet Wallace, and other prominent figures tell how to coalesce and universalize activism into a more powerful movement wave—at local, community, national, and international levels. Vivid and highly accessible, this​ book is for activists, students, and all ​citizens concerned about the erosion of justice and democracy. It thoroughly illuminates the rationale, theory, practice, ​humanism, love, ​and joy of ​the​ ​social transformation that we urgently need.